To further Arts Action 21's mission of nurturing a thriving arts community in the 21st century, this blog will periodically feature posts about the work of arts organizations and artists in the Silicon Valley region. With this entry, we are pleased to introduce our readers to the work of Quinteto Latino, an innovative and dynamic chamber group which has served the community for ten years. Quinteto Latino, a wind quintet specializing in the interpretation of Latin American classical and contemporary music, was founded in 2001 by French hornist and San Jose native, Armando Castellano. Since the group’s inception, the passionate artists of this unique wind quintet -- flute, oboe, clarinet, French horn, and bassoon -- have dedicated themselves to performing with world-class artistry in communities not traditionally served by classical musicians. Though a musician his entire life, Armando rarely had the opportunity to perform works culturally relevant to him and his community until the formation of this unique ensemble. By championing young and lesser-known composers of Latin American and Caribbean heritage, Quinteto Latino seeks to expand the boundaries of classical music, reach new audiences, and inspire new generations of players. The members Quinteto Latino are enthusiastic educators, and they perform in schools through the San Francisco Symphony's Adventures in Music program, using music to discuss culture and diversity. The group performs throughout the year at private events, recitals, and benefits by invitation, and are especially interested in serving the Latin community with their music. Their mission is two-fold: to expand the cultural boundaries of classical music, and to make that music available, relevant, and inspiring to entirely new audiences. 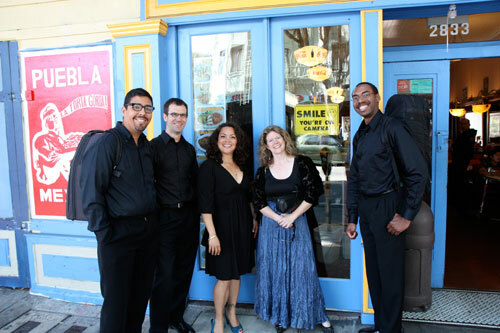 Quinteto Latino's next public event is on May 3, 2011, at Berkeley Chamber Performances.